Sarah and Sean met at a brunch after Mass. At the time, Sarah was not expecting to meet the man she would marry, but was joyful to make the acquaintance of her handsome new friend! The center of their relationship quickly became Christ present in the Eucharist. The adoration chapel and weekly hours of prayer together solidified the growing bond between them. Jesus was present at the beginning and end of Sarah and Sean’s courtship, which eventually concluded with an engagement. 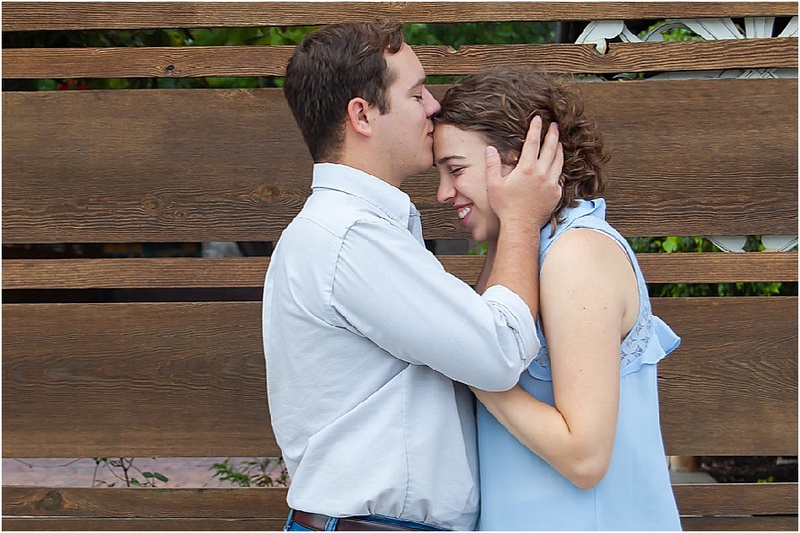 Their contagious joy and gratitude for the Lord and the sacrament of marriage is evident even through their photographer, who walked away inspired by their Christ-like love. In Sarah’s Words: When I first met Sean, I was looking for a seat--not love! But as is often the case, the Lord had other plans. So when I saw an empty seat next to a handsome, smiling man at brunch after Mass, the Holy Spirit nudged me to go make a new friend. Flash forward one month later, and we were on our way back from an evening trip to adoration when Sean asked me to go on a date with him. By this point I knew where the Lord was guiding my heart, and I was able to say yes, joyfully. Four beautiful months of dating ensued, and as Sean and I grew closer and closer we found ourselves growing closer to Christ as well. We played laser tag, went to concerts, and even witnessed the beatification ceremony of a distant relative of Sean's. We began a thirty day devotional and resolved to spend at least thirty minutes in adoration together each day to complete our journaling portion. As the devotional drew to a close, Sean took me on a date to see Les Miserables. On our way home we stopped at our favorite adoration chapel, and as he led me in I noticed rose petals covering the floor. I rounded the corner, and Sean stopped, knelt down on one knee, and in front of the Blessed Sacrament asked me to be his bride. Nine months of preparation flew by, and on September 29, Sean and I stood face to face in the same church where we met and exchanged vows during our nuptial Mass. The most amazing thing about our wedding, we both agreed, was from the moment our entrance hymn began, the only thing we saw was each other, and we felt the love of Jesus so clearly burning in our hearts that we smiled like fools the entire time. It was such a blessed reminder of Christ's love for us and his position as the cornerstone of our marriage. Our faith has been integral to our relationship--it is the soil to the seed of our love. I can't imagine how God could have formed a man more perfect than Sean to hold and cherish my heart for him while here on earth. And I can't wait to continue living my vocation with him for the rest of my life. In Allison’s (the photographer’s) words: I first met Sarah after Mass one Sunday when my two-year-old was just a few months old. Sarah's bright and bubbly personality inspired my baby to reach for her even though she was a complete stranger. She quickly volunteered to babysit any time we needed, and she has been a wonderful friend to our family the past few years! When Sarah and Sean met, they were clearly perfect for each other. They crossed paths at a Catholic social gathering and were inseparable soon after. Their relationship and courtship was Christ-centered, and they even spent a holy hour together each week. It made sense for Sean to propose to Sarah in the adoration chapel with Jesus present. 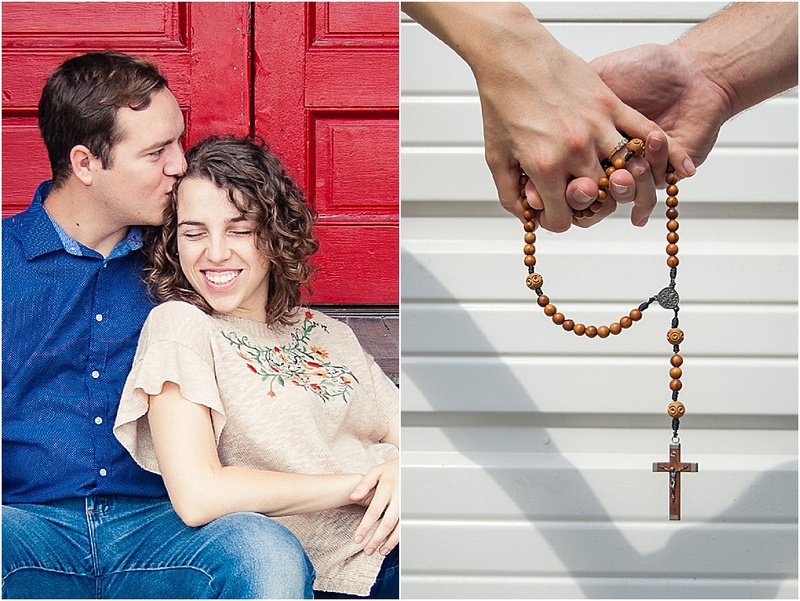 When I shot their engagement session, I knew I wanted to incorporate their faith in a little way. Including the rosary in some of their photos was a nice homage to our Blessed Mother, whom I am certain had a role in bringing this beautiful couple together. 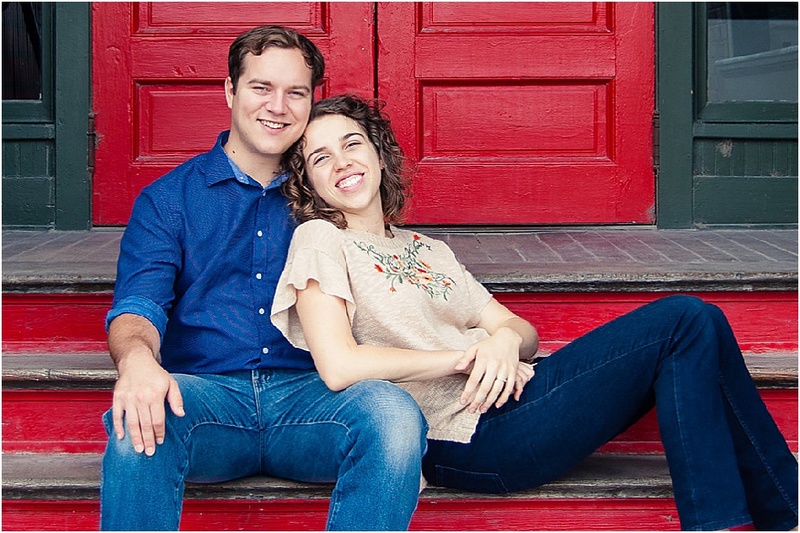 In a world that is so against sacramental marriage, it is such a joy to work with couples who are seeking Christ and his Church above all else. Even after spending just an hour with Sarah and Sean, I went home to my own husband with a renewed sense of joy and fervor for our marriage. Seeing these young, faith-filled couples who are so eager to spread the Good News of Christ simply by their example is such an inspiration. It really is an amazing reminder of how their joy is contagious, and even more so how the joy of Christ is contagious!